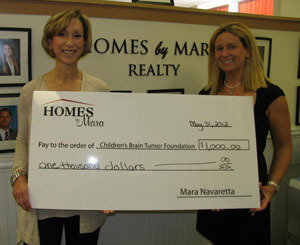 Syosset, NY - Mara Navaretta, President and Owner of Homes By Mara Realty of Syosset, NY, recently presented Children’s Brain Tumor Foundation (CBTF) with a $1,000.00 check contribution that resulted from a percentage of commissions collected among her and participating agents. This marked the second check donation made by Homes By Mara since Navaretta established a special agency reserve fund the beginning of this year as part of her agency’s year round commitment to supporting CBTF. Navaretta will continue to donate agency commissions throughout the rest of this year, with another donation of the agency’s annual profits to follow at the end of the year. She and her agents are also planning to participate in some of Children’s Brain Tumor Foundation’s upcoming fundraising events. Homes By Mara is a boutique real estate agency spearheaded by licensed broker and real estate veteran Mara Navaretta. Featuring a team of highly skilled and trained agents, Homes By Mara specializes in servicing North Shore’s residential market on both the selling and buying sectors. Located at 567 Jericho Turnpike in Syosset, NY, the agency offers convenience and a turnkey solution in accommodating all real estate needs by sharing its office space with the law firm, Navaretta & Howard LLP. Navaretta and Howard, LLP has a special focus in real estate law and provides council and representation for all Homes by Mara agents to assure the homeowner receives quick and accurate answers to legal questions that may arise in the course of today's real estate transaction. Also available is a concierge service that consists of recommendations for every trade associated with the real estate industry including movers and contractors. For more information about Homes By Mara, please call 516-364-2500 or visit www.homesbymara.com. Subject: LongIsland.com - Your Name sent you Article details of "Homes By Mara Realty Invests in Children's Brain Tumor Foundation With Check Contribution"